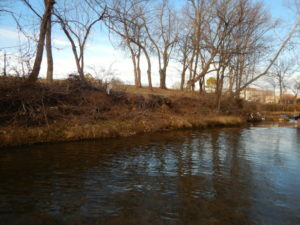 With the goal of reducing total phosphorus, total nitrogen, and sediment loadings, the WCRC proposes to design and direct the implementation of an urban stream restoration project on Osage Creek as it flows from east to west along the southern border of the proposed park. 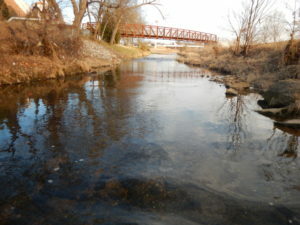 Approximately 2,000 feet of stream channel and riparian property will be restored along with 800 feet of Stoney Brook that flows through the center of the park. Several small wetland areas in the adjacent floodplain will also be enhanced through native plantings. Bed features such as riffles and pools will be designed and constructed based on the stream morphology. Both rock vanes and toe wood structures will be used to stabilize the streambanks and create aquatic habitat. 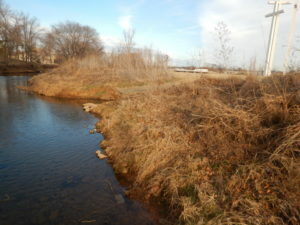 Also, the riparian areas will be re-vegetated with native species of plants and invasive vegetation will be removed.